summer is coming to an end which is fine with us as we love to watch the seasons change. it's hard to say which is our favourite because every season comes with lots of beautiful things. now we're excited about all the root vegetables, mushrooms and comfort food, shorter days and cool air and for it to finally be acceptable again to spend evenings on the sofa with apple crumble and tea. it's even more wonderful to see the change in scenery at our farmhouse in tyrol. it's still under construction but we love to visit, watch it come to life and enjoy the tranquil surroundings - just look at the fog in the mountains and our sweet little duck family! one of our favourite breakfasts on a cool morning is porridge. it's something we take a long summer break from and look all the more forward to as soon as the temperatures drop. it's hearty and warming and fills you up with love. oats are so amazing - they're full of nutrients and protein and are great for healthy skin. blueberries are still in season so we want to make the most of them while they last - you can store the compote in the fridge to even keep them a little longer. 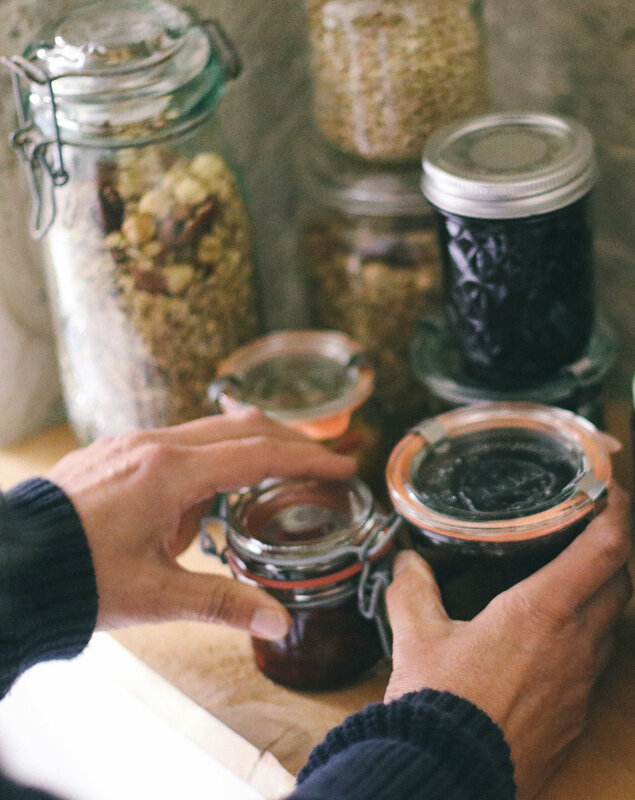 we love to re-organize our pantry for each season with seasonal staples! feeds a hungry duck or two birds. real porridge has to be made on the stove top! so pop all ingredients into a pot and bring to a boil. once it's bubbling, let cook on low heat for approx. 5 minutes and keep stirring. bring blueberries and water to a boil and let simmer on low heat. if you want the compote to be a little finer you can gently crush the blueberries with a fork. sweeten to taste and serve with the porridge or store in a mason jar and pop in the fridge. serve the porridge up in two bowls, top with compote and homemade granola and enjoy! Sign up to receive new posts and news to your inbox.